Bike-share programs (those rental bike stations) are intended to reduce traffic and the carbon footprint of large cities by providing locals with one-way rides to a destination point, usually their job. What’s the Difference Between Bike-Share and Bike Rentals? Traditional bike rentals (like Wheel Fun Rentals) serve the leisure and recreational riders and families that want to explore the city and take in the local sights. Recreation rentals are focused around fun, family, great customer service, and are a better buy, we’ll tell you why . . .
– Size and Fit Options – Easier to Pedal – Maps, Locks, Helmets and More! Wheel Fun Rentals has straightforward low pricing with no hidden fees and a 15 min grace period – standard cruiser bikes start at $10 an hour, $25 for a half day, and $32 for a full day. Read the fine print when renting from a bike share! Bike-Share pricing is typically designed for short trips. Take Philadelphia’s Indego Bike Share for example, a walk-up rental is $8 an hour, but go over the time by one minute and they start charging you. A one hour rental is $8, a half day rental is $32, and a full day rental is $64! Bike-Share systems typically restrict use to those 16 or 18 years of age or older. Therefore families cannot ride together. And helmets are not available with a bike share system. Wheel Fun Rentals caters to children of all ages (with guardian supervision) and provides a variety of helmet sizes to keep kids and adults both legal and safe. Bike-share systems only provide one size bike; they are twice as heavy as a typical bike, plus they only have one gear. Wheel Fun Rentals has a plethora of bikes that fit all different shapes, sizes, and age groups. Choose from cruiser bikes, city bikes, tandems, road bikes, and family bikes like our Surrey. In addition to our bike variety we also have add on accessories like kids trailers. We have what you are looking for! And we’ll assure you get the right size; adjusted to you for greater comfort, optimal pedaling efficiency, and maximum safety. Bike-Share docking stations, although open 24 hours, are all unmanned. Bikes in these systems do not get looked at between every customer and at times are not well maintained. Plus, docking stations have a tendency to fill up or be completely empty during peak commuter hours. 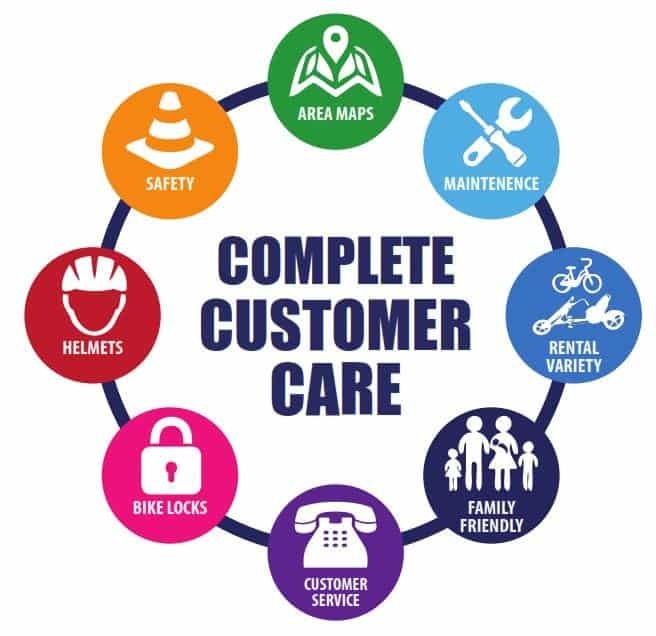 Wheel Fun Rentals’ kiosks are always staffed and our friendly and knowledgeable employees can assist you in picking out the right bike and becoming familiar with it, adjusting items like seat height, check tire pressure, fit you for a helmet, give you verbal directions, and so much more. Our fleet is well maintained as it’s looked over by a certified mechanic regularly, and inspected for safety before every customer goes out. Wheel Fun Rentals has a large fleet size to avoid any equipment shortages – there is always something to pedal at our locations. Wheel Fun Rentals provides maps, bike locks, helmets, bike bags & baskets (a place for you to put your stuff), free of charge. We also offer self guided tours, and other items to make your journey safe and enjoyable. Try exploring the city with a bike-share bike: you’ll receive no helmet, no map to show you where to go, and no way to lock the bike up if you want to shop, walk around, or stop for lunch. All in all, riders looking for a quick trip over flat terrain might prefer to rent from a bike-share system. But riders looking for a more recreational experience to enjoy with their friends, family or loved one will be much more satisfied with bike rentals at Wheel Fun Rentals. With a variety of bikes to choose from, safety equipment, a well maintained fleet, bike tours, and excellent customer service, riders are free to explore and discover the city safely and enjoyably at an affordable price. Tags: Indego bike, Indigo Bike, Philadelphia bike share, Philly bike station, bike kiosk, bike rental thing, bike rental, bike share, bike drop, bicycle station, bicycle rental, Hop on hop off bike, biking in Philly, bicycle tours.